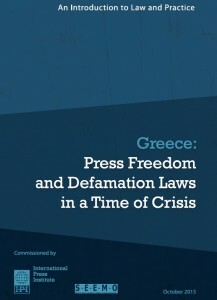 Defamation remains a criminal offence in Greece. Insult (Criminal Code Art. 361): Insult is defined as insulting the reputation of another person through word or deed or otherwise, except if the act may be punishable as defamation. The punishment imposed may be either a fine or imprisonment for up to one year, or both. According to Art. 361(2), after taking into consideration the circumstances and the personality of the person offended, if the offence is not particularly severe, the perpetrator shall be punished only with [administrative] detention or a fine. Unprovoked insult by action (Criminal Code Art. 361a): This offence is defined in the same terms as insult, however in this case the act must be committed through action and not have been provoked. This offence is punishable by imprisonment of up to three months or a fine. If two or more persons committed the act jointly, the punishment imposed shall be at least six months in prison. Defamation (Criminal Code Art. 362): Defamation is defined as claiming or disseminating before a third party facts about another person that may harm that person’s honour or reputation. It is punishable with up to two years in prison or a fine, or both. Slander (Criminal Code Art. 363): Slander is defined as defamation in which the information was false and the perpetrator knew it to be false. This offence is punishable with imprisonment of at least three months or a fine. In addition, the offender may lose certain political rights described under Art. 63 of the Criminal Code. Defamation or a corporation (Criminal Code Art. 364): This offence is defined as claiming or disseminating facts about a corporation (S.A.) relevant to its business, financial situation, general activities, or the persons who run and manage it in a way that might damage the public’s confidence in the company and generally to corporations. This offence is punishable with up to one year in prison or a fine. However, if the perpetrator knew that the facts claimed were false, the punishment shall be imprisonment only. Art. 369(1) also provides that the plaintiff may request from the court publication of the court’s judgment at the defendant’s expense for crimes committed under Arts. 361-365. Furthermore, if the offence was committed by the press, the publication must contain at least the rationale of the court’s decision as well as the judgment. According to Art. 369(2), the newspaper or magazine publisher must publish the court’s entire decision with eight days from the verdict in the same position as the original offending article. Non-compliance is punishable with up to one year in prison or a fine. Additionally, Art. 369 provides that the provision of the Criminal Code (Art. 229) that punishes false accusation – the filing of a suit or the lodging of a false accusation of a criminal action with the authorities with the intent to cause prosecution of a person, punishable with up to one year in prison – can also be applied in connection with Arts. 361-365. This offence is punishable with a minimum of one year in prison. The Greek Criminal Code also contains provisions relevant to dignity of sexual and gender rights, with increased protection for family members, as well as for minors. Art. 337 states: “Anyone who brutally attacks the dignity of another in the field of their sexual life, either with lewd gestures or suggestions concerning indecent acts, is punishable by imprisonment of a maximum of one year or a fine.” Art. 337(2-5) provide for heavier punishments when this offence is committed against children under 12, minors, or job seekers and if committed through the Internet or in the workplace. Additionally, Art. 9 of Law 3500/2006 on Inter-Domestic Offences of Sexual Dignity provides that a person who insults the dignity of a family member with particularly degrading speech or deed referring to their sexual life can be punished with up to two years in prison. However, public officials have a procedural advantage in criminal defamation cases. According to Art. 368(1) of the Greek Criminal Code, prosecution for the offences described in Arts. 361-365 can only be initiated upon complaint, but may be conducted ex officio when the offended party is a public official. In addition , if the victim is a police officer, port officer, fire brigade officer or health worker and the act occurred during while the victim was performing his or her duty and the offender acted masked or by altering his or her characteristics, criminal prosecution can also occur ex officio. Furthermore, according to Art. 368(3), if the victim is a civil servant and the act occurred during the execution of his or her official duty or in relation to his or her duties, a complaint can also be submitted with the superior authority of the minister. In the case of libel of the deceased, the surviving spouse and children also have the right to submit a complaint, and if they are also deceased, this right can be exercised by the surviving parents and siblings. In the case of defamation of a corporation, the right to file charges falls to the managing board or any other person who has a substantial legal interest (Art. 368(2)). Insulting or defaming the President of Greece is a criminal offence under Art. 168(2) of the Greek Criminal Code. The penalty is imprisonment for up to three months. In addition, Art. 14(3b) of the Greek Constitution allows the seizure of publications (before or after the fact) that contain insults toward the President of Greece. Expressing hatred or contempt for, removing, destroying, deforming or desecrating the official flag of the State or emblem of its sovereignty is a criminal offence under Art. 181 of the Greek Criminal Code. The penalty is imprisonment for up to two years. In addition, publicly insulting the Greek Parliament is punishable with imprisonment of at least three months (Art. 157(3)). Publicly insulting departmental, municipal or other councils of local authority is punishable with up to two years in prison. Prosecution takes place with permission of the Parliament or council. If applicable, offender may also be punished with dismissal from public office (Art. 157(4)). Insulting the honour of the head of state of a foreign country that is at peace with Greece is a criminal offence under Art. 153 of the Greek Criminal Code. The punishment is imprisonment for an unspecified term. The act is only prosecuted at the request of the foreign government. Art. 154 states that if the act referred to in Art. 153 is committed against an ambassador or any other diplomatic agent of a foreign country, the perpetrator shall be punished with a prison sentence of up to two years, in case a more severe punishment is not prescribed by some other provision of the law. The prosecution can only be initiated upon complaint from the victim or the foreign government. Offending the flag or emblem of sovereignty or interfering with a national anthem of a foreign state that is at peace with Greece and is recognised by it is a criminal offence under Art. 155. The punishment is a fine or imprisonment for up to six months. The prosecution may be initiated only at the request of the foreign government. Insulting the memory of the dead with cruel or malicious defamation or libel is a criminal offence under Art. 365 of the Greek Criminal Code. It is punished with imprisonment for up to six months. Malicious blasphemy is a criminal offence under Art. 198 of the Greek Criminal Code. Whoever shows disrespect to the divine by means of blasphemy faces imprisonment for up to three months and a fine of maximum €3,000. In addition, the act of publicly reviling the Eastern Orthodox Church of Christ or any other religion tolerated in Greece (“religious vilification”) is a criminal offence under Art. 199 and punishable with up to two years in prison. 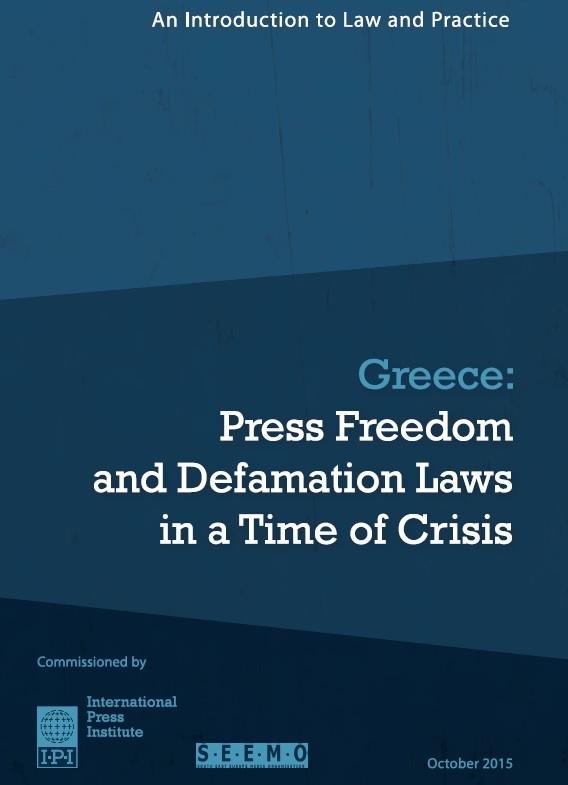 The Greek Constitution also allows for allows for the seizure of publications, either before or after circulation, that contain insults against the Christian or any known religion. The following data were provided upon request to the International Press Institute by EL.STAT., the Hellenic Statistical Authority. The data noted here refer to the year 2010, the most recent year for which information on criminal convictions has been processed and available for sharing . • For Art. 361 (insult), there were 580 convictions, resulting in 561 prison sentences , 17 criminal fines and two other types of sentences . In terms of the prison sentences, 10 were for one to five years, 16 for six to 12 months, 109 for three to six months, 189 for up to three months, and 237 for up to one month. • For Art. 362 (defamation), there were 19 convictions, resulting in 19 prison sentences, of which two were for six to 12 months, 15 for three to six months, and two for up to two months. • In 2006, Aggeliki Mika, who was then a municipal councillor in Nigrita, wrote a newspaper article containing allegations that the mayor of Nigrita had shown favouritism while hiring officials. In 2008, a court of first instance convicted Mika of criminal libel and ordered a suspended eight-month prison sentence in addition to €50 in damages. In 2009, the Court of Appeal of Thessaloniki upheld the judgment but reduced the prison sentence to seven months. Mika later appealed to the Court of Cassation, which dismissed her appeal. In 2013, the European Court of Human Rights (ECtHR) found that Mika’s right to free expression had been violated due to the severity of the punishment (Mika v. Greece, no. 10347/10). • In March 2015, a court sentenced prominent investigative journalist Kostas Vaxevanis, editor of the investigative magazine HotDoc, to 26 months in prison, suspended for three years. The charges were in relation to an article that analysed a prominent businessman’s alleged involvement in the 2012 to 2013 Cypriot financial crisis. In September 2016, a three-judge panel of the Athens Court of Appeal on Monday unanimously threw out Vaxevanis’ conviction . • In January 2017, an MP for the extreme right Golden Dawn party, Yiannis Lagos, pressed criminal defamation charges against a television journalist, Tatiana Stefanidou. Stefanidou had played a clip of an incident in which Lagos and several of his supporters raided a school in Perama to protest plans to allows refugee children to attend the school. Stefanidou called Lagos a “bully”. She also declined to take a call on her show from a Golden Dawn supporter, reportedly saying that “she would not allow her show to be used as a platform in support of such actions”. Police arrived at Stefanidou’s work and home and sought to arrest her. The case is currently under examination by prosecutors. The court ordered Kourakis to pay €2,300 of Andrikakis’ legal expenses. Information for Greece was originally collected by IPI as part of the “Out of Balance” report, published in January 2015 with support from the European Commission and incorporating research contributed by Center for Media, Data and Society at Central European University in Budapest and by the SHARE Foundation in Belgrade. This entry was later expanded and updated by IPI as part of a study commissioned by the Office of the Representative on Freedom of the Media of the Organization for Security and Co-operation in Europe (OSCE).